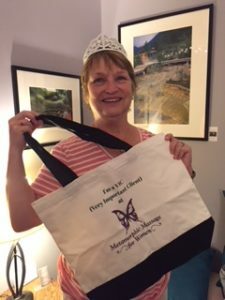 Lisa first started coming to Metamorphic Massage for Women nine years ago, when she decided to get a massage as a birthday gift to herself. She had no idea where she should go, but she knew she had no interest in going to chain spa. After an internet search, she found Linda, and between the reviews, location, and the info on the website, she was convinced this was the place for her! Southern Illinois born and bred, Lisa originally planned to attend college with a double major in history and Spanish, but marriage derailed her from that plan. After relocating to Oklahoma and Texas, the closest she thing she could find to that degree programs was studying education with a focus on history and Spanish. Within a few years, Lisa found herself a single mom with three young daughters to raise. She began teaching in Texas, before moving to North Carolina in 2004. After teaching history, Spanish, psychology & sociology for 24 years, Lisa retired last year. Since retiring, Lisa has increased her volunteer contributions at The Carolina Poodle Rescue, which she’s been a part of for 2.5 years. Lisa and her second husband (she remarried 10 years ago) provide short- & long-term foster homes for rescued dogs and provide transport for animals between shelters and homes. Lisa is also an adoption counselor and loves being able to match dogs to their furever homes, and works with their Save our Seniors program, rescuing old, badly behaved, or ill dogs that need more specialized care. Lisa is happy with all the free time she has now that she’s retired, as it gives her a lot more time with friends, an opportunity that can be nearly nonexistent when you are teacher. She’s looking forward to reaching another goal, writing children’s books based in history. She reads a lot of children’s literature for inspiration. Her favorite writers are Rick Riordan, J.R.R. Tolkein, and she to read just about anything but horror. Her favorite readings are biographies, “the type of books most people use as doorstops” keep her riveted. She also admits that she likes “beach books” because it can be fun to escape. She enjoys crocheting and embroidering, which she does when relaxing at night or on road trips with her husband, and finds herself making a lot of gifts. Her daughters are now having children, and she recently learned about a fourth one on the way. She’s excited to buy some pink yarn for the baby’s quilt, as the rest of them have been blue! She hasn’t been able to spend as much time with grandkids because they live in Texas and Chicago, but now that she’s retired, she’s thrilled she is going to be able to see a lot more of them. Her children and grandchildren are her biggest passion. Lisa’s words of wisdom for women looking to live the healthiest, happiest life you can: Don’t put selfcare last on the list…it should be at the top! You HAVE to take time to yourself. Spend money on selfcare that seems like a luxury, because it’s not. Carve out the time and energy for yourself. It is okay to say no…learn how and do it for your emotional and physical well-being. Because she was a single mom, Lisa always put herself last and never spent money on herself, because it just didn’t occur to her to do so. Her advice for single moms with no support from the father: don’t feel guilty about taking a little something for yourself. Even if it’s taking a cup of tea in the bedroom and shutting the door. Being there for your children every second of the day isn’t healthy for anyone as it gives everyone unrealistic expectations about what you should do. Her goal now is to get as healthy as she can, because she’s at an age that if she doesn’t turn it around fast, it’s not going to turn around. Her health is her ultimate priority now. Lisa says she wouldn’t have survived the last nine years without massage. Her pain was unbearable and coming to Metamorphic Massage for Women was the best gift she ever gave herself! This entry was posted on October 2, 2018, in Client Spotlight. Bookmark the permalink.